New Delhi: The investors interest seems to be growing fast in gold ETFs, as the average daily value of their trade on the National Stock Exchange (NSE) has grown by over four times since the beginning of this fiscal. The gold ETFs (Exchange Traded Funds) enable investment in the precious metal on the stock exchange platform in an electronic mode and without its purchase in physical form. The daily average number of trades has also increased by 300% during this period, from 5,891 average daily trades in April to 23,874 in September. The gold ETFs track the gold prices and each unit of these ETFs is generally equivalent to one gram of gold. While the global markets have been in a turmoil over the past one year, and asset classes like stocks giving huge negative returns, the gold prices have rallied smartly. Tracking the soaring gold prices, the gold ETFs have appreciated by over 30% over the past one year, although the prices have fallen somewhat in past one month. As the investor interest in the gold grows in the run-up to Dhanteras and Diwali festivals, when it is considered auspicious to invest in gold and other valuable assets, the experts expect the gold ETF trade volumes to rise further in the coming days. Diwali will be celebrated on 26 October, while Dhanteras falls two days before that. To cash on the festive demand, the NSE has also begun a new media campaign to spread the word about the gold ETFs being a “smart way to buy gold". 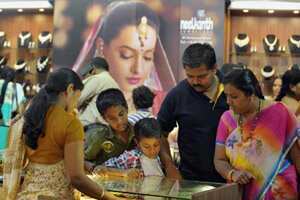 Traditionally, Indians have been investing in gold on auspicious days like Akshaya tritiya, Dhanteras and Diwali. On the day of Akshaya Tritiya on 6 May 2011, the NSE recorded a record trade of 20 lakh units of gold ETFs worth ₹ 423 crore. A total of 11 gold ETFs are listed on the NSE and their monthly trading value has grown to ₹ 1,936 crore as on September 2011, as against ₹ 356 crore in January this year. The total assets under management in gold ETFs have more than doubled in the past one year, while it has grown by over five-times in two years. As per the latest available data, the total assets of the gold ETFs stood at ₹ 6,119 crore at the end of July 2011.